Eplagarðr Kindred is a group of family and close friends who have joined together to honor and worship the Norse Gods and Goddesses, the Ancestors and the Landvaettir. We are a diverse group with varying backgrounds and interests, but we are united in our bonds with each other and in our desire to follow the path of our Northern ancestors. Among us, we have those who are drawn primarily to the Ancestors, those who are drawn more to the Landvaettir, and those who have close connections with the Gods and Goddesses, so we honor each equally. 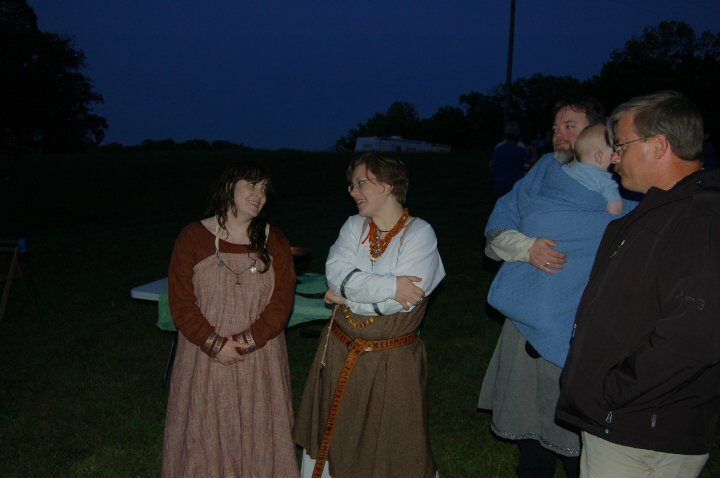 Eplagarðr Kindred formed in August, 2004 and currently has 5 Kin-members, 6 Fellows, and 6 mini-members. We hold regular blots - including 3 or 4 public blots a year, and host Apple Valley Winternights Gathering, Camp Idunna and Winter Wassail. We also have some avid (and very skilled) brewers and crafts-people among us and quite enjoy the fruits of their labors. Many of our events feature mead made by our Kin. Eplagarðr Kindred is broken up into Gythja, Kinsfolk and Fellows. Gothi / Gythja: The gothi or gythja of Eplagarðr Kindred is the chieftain of the Kindred. This person is in charge of organizing the Kindred calendar and making sure that each event has a volunteer to lead it, as well as all necessary tools and supplies. Kinsfolk: Kinfolk of Eplagarðr Kindred are full members who have full voting privileges within the Kindred. Fellows: Fellows of Eplagarðr Kindred are members of the Kindred, though they do not have full voting privileges on Kindred decisions. They do, however, have a voice. They are allowed (and encouraged) to be present for all official Kindred discussions and may voice their opinion. The primary difference is that when a situation calls for a vote, the Fellows may not vote. Currently, Eplagarthr Kindred is not accepting new Kin members. However the Kindred is open to considering requests to become Fellows of the Kindred. We are a close-knit family Kindred and we take membership in our Kindred very seriously. Before considering requesting to join the Kindred, it is important to understand what is important to the Kindred, as well as what the Kindred offers to their members. If our values do not match your own, then it is best to remain a friend of the Kindred. There is no issue with attending Kindred events for years and never becoming a member. If, however, after reading the following, you would like to be considered as a Fellow of the Kindred, you must let the Kindred know of your intentions. Once this is done, you will be expected to follow these guidelines of the Kindred for one year’s span - attending as many Kindred events as possible (half our public events at a minimum), and following the values listed here. This will allow everyone in the Kindred to get to know you, to ensure compatibility with existing members and with our views on Asatru, and to demonstrate a level of commitment to the Kindred. Each potential Fellow will be considered on a case-by-case basis. The Kin and Fellows will discuss whether to accept any potential Fellows, and the Kin will vote. The Kindred will only accept someone if the vote is unanimous. If accepted, the new Fellow will be welcomed into the Kindred during a private sumble. 1. We are an Asatru Kindred. We do not ask any of our members to forsake other gods, but we do expect our members to respect and honor the gods and spirits of Asatru. 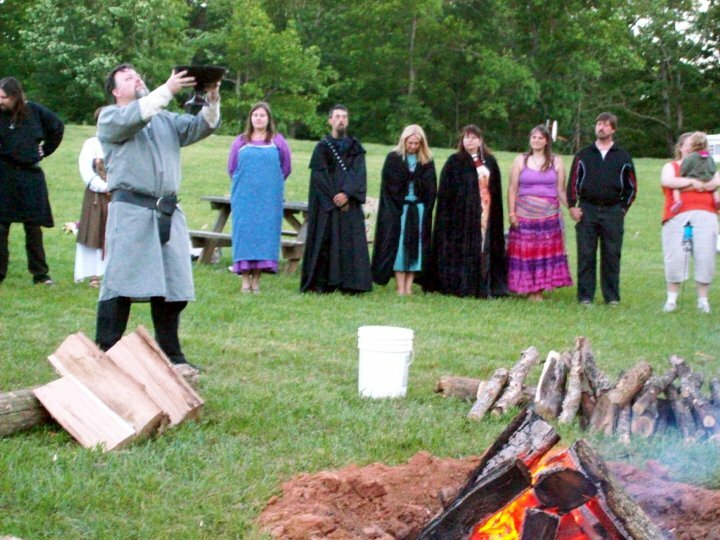 Likewise, while we do not ask any members not to worship other deities, we will ask them to keep worship of non-Asatru deities as separate from what we do as possible. 2. We do not ask any of our members to not affiliate with other religious groups. The Fellows can even have other groups as their primary religious obligations, with the Kindred as secondary. Kin are expected to have no higher religious obligations than the Kindred. 5. 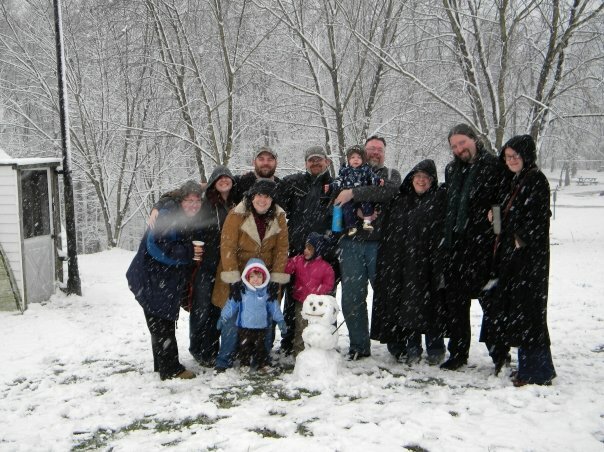 We do require attendance at 4 (at least) Kindred events a year, and we strongly encourage all members to attend Yule (or Twelfth Night), Winternights and our Thor blot whenever possible. 6. We expect all members to help the Kindred and the other members when, where and how they can. We realize this is often very limiting as we live far apart and have limited resources, but we should at least attempt to help each other when a request is made. Likewise, Kindred members are expected to only make reasonable requests on other members. 2. Provide pesonal religious services, such as naming rites, professing rites, wedding rites, funeral or rememberance rites, divorce rites and coming of age rites. 3. Provide counseling and support to each other when needed. Always being available to each other for help and advice in spiritual matters. 4. Always discuss decisions related to Kin, Fellows and the Kindred. Though fellows do not have a vote, they will be kept informed and they will get a chance to speak their mind on matters. 5. Teach and aid Fellows, Kin and our young in spiritual matters, as well as in our spiritual pursuits in whatever way we can. - The Kindred should have some sort of place in your devotionals and worship. - Members should offer other Kindred members hospitality. Likewise, guests are expected to not over-extend their welcome and to not ask too much of their hosts. 2. All Kindred members should help each other when they are in need. 3. Our Kindred currently has no dues. We will let the Kindred know if money or supplies are needed for events. Other than that, voluntary contributions are encouraged. Our Kindred has a lot of very, extremely public events. More than that, Kindred members run or help run way more than our share of festivals. No one within the Kindred is expected to help with festival planning or running. It is appreciated and you will likely be asked, but you should feel under no obligation to say yes. Also, if you have trouble attending Kindred events due to cost, let us know. We believe that Kindred members should always be able to attend Kindred events and we will do our best to make sure that happens. In some cases, this may mean that we ask you to help out more with the event in return for a discounted (or waived) price of admission.